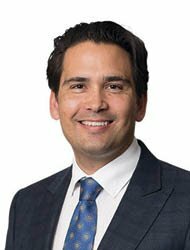 The audience of leading business people at this year’s Business Leaders’ Lunch heard Tauranga MP Simon Bridges and Mayor Greg Brownless share major concerns over how government was holding back on needed infrastructure funding. 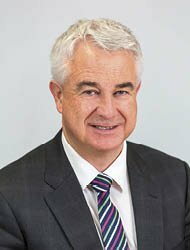 Meanwhile, the third speaker, University of Waikato senior deputy vice-chancellor, professor Alister Jones, emphasised the positive impact that could be expected with the new Tauranga campus opening. The annual lunch was chaired by Tauranga Chamber of Commerce chief executive Stan Gregec, who has recently announced he plans to step down to explore new options after four years in the role. It was hardly surprising that Bridges, addressing the leaders’ lunch for the first time in his new role as Leader of the Opposition, would be highly critical of central government pulling the plug of major local infrastructure projects that had been on the books under the National government. Bridges cited concerns over the government’s decision to freeze funding for new roading north and to serve fast-developing Tauriko, and what he described as a land supply crisis, and the NZ Transport Agency leadership in disarray. Localism involves giving greater choice to communities about the nature of local public services and how they are delivered. The region needed to see more bold leadership given the issues of dealing with faceless bureaucracies, and planning that could stretch on for years, Bridges added. He went on to express his support for the concept of incentivising councils by allowing them to keep the GST for local use when they had acted effectively to cut planning blockages and create genuinely new developments. “It’s not National Party policy – yet,” he said. But he stressed that land supply was critical for the region’s development. His comment reinforced Tauranga Mayor Greg Brownless’ plea for more localism and less government in decision-making. “A 2016 analysis of one NZ city saw its council invest $93 million for growth infrastructure, yet at best that council will only recover its costs,” he said. “The government on the other hand will make a $52 million net gain on GST relating to the land sales alone. Brownless said the number one issue facing Tauranga and the surrounding areas was the growth challenge, with 35,000 additional houses required over the next 30 years in Tauranga alone, and significant population aging with most growth expected in the 65-plus demographic. For the council the initial priority was to push ahead with development at Te Tumu (7000-8000 homes) and Tauriko West (3000 homes). The transport network suffered significant constraints and the network was already under significant pressure in some locations. More growth will exacerbate this problem without significant investment,” said Brownless. The issues are fundamentally the same – the challenges of growth and infrastructure and amenity development. Brownless said that to get Tauranga and the subregional share of Government funding, TCC, Western BOP Council and the BOP Regional Council through the Smartgrowth Partnership and together with NZTA, were working on an important urban development and transport project called the Urban Form and Transport Initiative (UFTI). “This is a collaborative approach driven by the understanding that to create a better future, Bay leaders must all work together to more fully integrate and action urban development and transport planning,” he said. But rather than thinking the answer to every question was more control from Wellington, Brownless argued for more localism. That meant a more effective partnership between local and central government and a willingness to incentivise local government to take a greater role in shaping their own social and economic outcomes. And it required more effective partnerships between councils and their communities, from business organisations to groups to neighbourhoods. “Localism involves giving greater choice to communities about the nature of local public services and how they are delivered,” he said. Professor Alister Jones told the audience that the University of Waikato’s ultimate purpose was to create and disseminate knowledge for the benefit of society. “The opening of our new campus is the beginning of a really exciting transformation for Tauranga – becoming a university city,” he said. Our vision is to be deeply embedded in the social and economic systems of the Bay of Plenty, and to transform Tauranga into a true university city. Universities attracted people, staff and students from the region, the country and around the world, all of which benefit the local economy, he said. This year’s numbers were already up on this time last year, and were projected to grow exponentially. “Universities don’t generate wealth – we are an enabler and catalyst for wealth generation for others,” he said. The opening of the new campus signalled new opportunities when it came to the role the new campus would play in the future economic growth of the Bay of Plenty. “University and business research collaborations are an essential part of growing a knowledge-based economy, bringing advanced skills to, and growing them from, the region,” said Jones. The new campus was the most innovative example of partnership in tertiary education in New Zealand, he added.